reasoning was that: 1. I would do less damage to my poor toes, and 2.There would be less area covered and therefore less opportunity for me to find alternate routes (that is – get lost). However, the rain was not helping to bolster wavering determination. Then there was Karin (Gastehaus keeper) who was quite unhappy about the possibility that I could catch a terrible cold, and possibly my death if I were to head out in such horrible weather. Death catching not being on my agenda, I decided to take the bus (there is no train service in Dorzbach). It made Karin feel better. As it happened it was possible to take the bus today, because school holidays had ended and buses were running again. You have no idea how much I enjoyed the bus ride to Dorzbach. Dorzbach is a town of about 2400 souls in the Jagst River valley, an exceedingly lovely area of Germany. 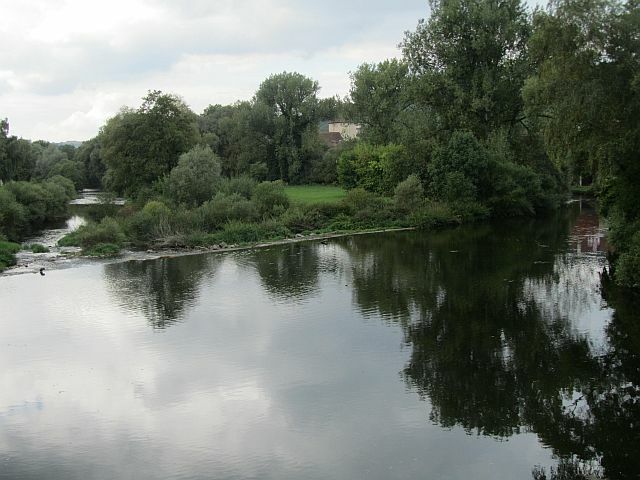 The Jagst River, a pleasant meandering river that travels for 189 km and eventually flows into the Neckar River (by Heidelberg), would be considered small to medium in British Columbia. 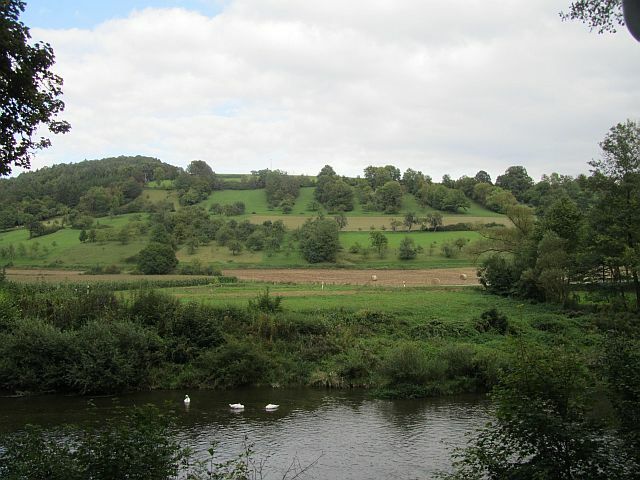 In Dorzbach there is a place along the river where you can swim, but it looks muddy and weedy to me. Having grown up swimming in a “see clear to the bottom”, weed free area of the Okanagan Lake, the thought of squelching through mud, and all sorts of mud creatures not to mention monster weeds, that are surely intent on wrapping themselves around my legs to pull me under, makes me feel all icky tingly. For those of you that are cycling enthusiasts you will be interested to know that the Jagst and the paralleling Kocher River (name originates from Celtic word “cochan” which probably means winding, meandering) form one of Germany’s favourite long distance bike tour routes. The 330km circular route, which is family friendly, but also has challenging sections, takes one through interesting towns and villages and fabulous scenery. As I have arrived in Dorzbach earlier than planned I decide to wander along a couple of the many Wander/Radwegs that are in and around the village as penance for taking the bus. Miraculously the rain stopped on the bus ride over and, while it is still overcast and glowering, there are hints that the sun will make an appearance. 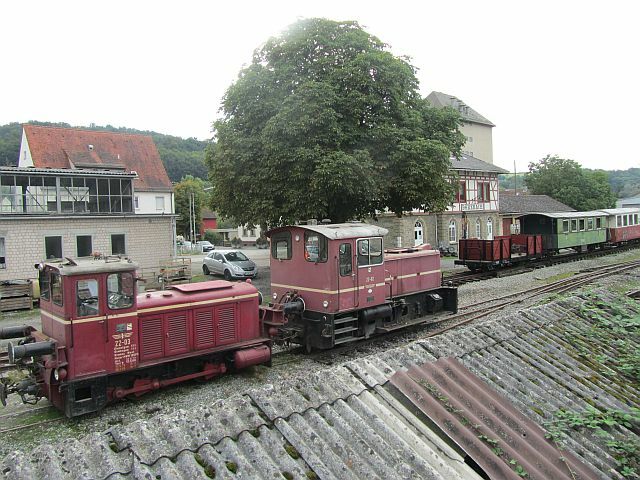 I head out to St. Wendel zum Stein – a side trip of five kilometers and one I would not have taken if I had walked (but then again maybe I would have). This is truly a fascinating little church and a testament to the value one man placed on his sheep. Well, that is what I understand from the signage. A shepherd found his lost sheep at this place and in gratitude he determined to build a church. Must have been some sheep as this would be a difficult place to build a church in modern times let alone when work started in 1478! The bulk of the work was completed between 1511 and 1515, with the small tower being added a couple of centuries later. St. Wendel is the patron saint of shepherds. 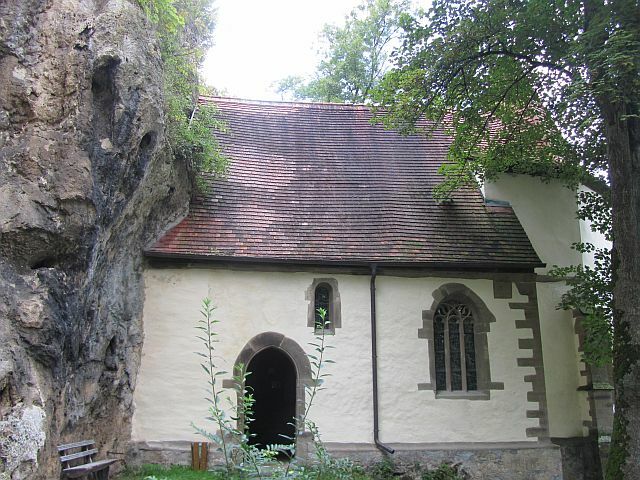 What makes this wee church standout, and not just for the sheep factor, is that it is built into the stone (zum stein). The rear wall of the church is cave wall rock. 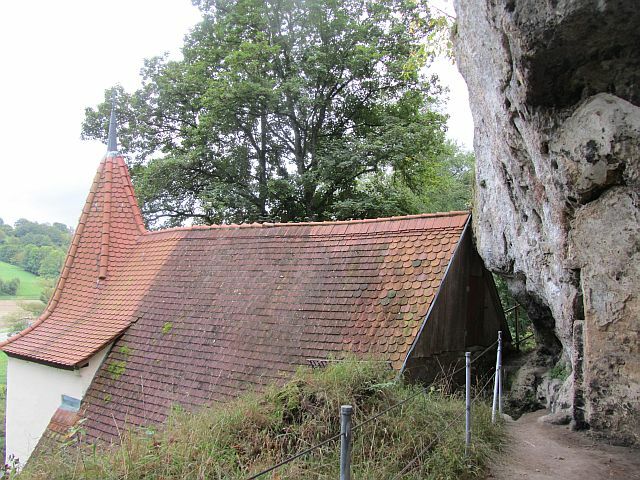 The cave complex right behind and above the church was inhabited many thousand years ago and eventually became a Celtic ritual place as well. The church is situated on the Jagst River. 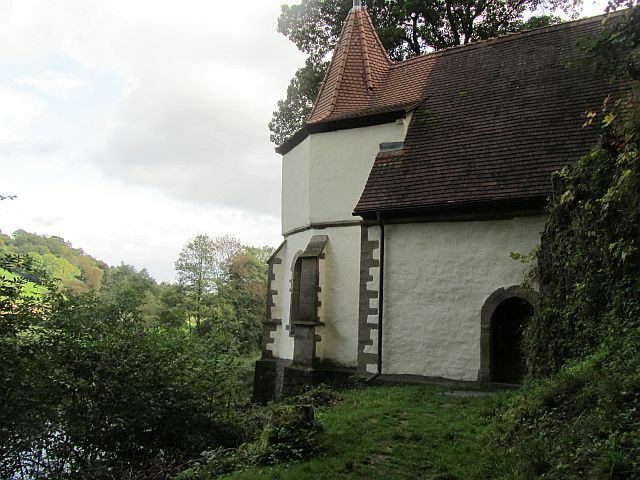 You can’t actually go around to the front of the church as it is too near the steep bank down to the river. In order to see the other side you have to go through the church. It is possible to do this because, even though the church is quite isolated, it is left unlocked. A tiny stream, purported to have healing properties, flows under the nearby uninhabited caretaker’s cottage. I don’t venture down to it as the leaf covered rock is slippery wet and I am mindful that absolutely no one knows that I am here. At the moment there are three swans alternately dozing and paddling about. The sun is happy in the day and has come out to play; I take my jacket off, settle a bench and lean back against the cave wall (first making sure there are no crawly critters hanging about). Happiness and Contentment snuggle into me like a pair of eight week old kittens. It occurs to me then that this is what has been missing from my pilgrimage. No not snuggling kittens, but the enjoyment of the moment. In all honesty I have not enjoyed the walking. While I did not expect the pilgrimage to be a walk in the park it was more of an endurance test than anticipated, although in some ways it was a forced meditation too. Breath in, breath out or a count of 1 2 3 4 to stop from thinking about the pain in my legs/feet and general miserable walking conditions. It didn’t end when the walk for the day was done either as then the aches, like unwelcome visitors, came to stay for a while. But that isn’t it completely though, after all my feet are very sore now too, and I am not looking forward to the walk back to town, yet, in this moment, I am blissful. At this time I can’t really define what it is. “It” is just out of reach, but like I have done I trust that it will come. However, for this moment and the next, I let go of the pressure of completing a pilgrimage that I am physically ill prepared for. I am posting this nearly 10 months later and the black of my toe nails has just disappeared. Addendum to the shepherd and his lost sheep. It turns out that when he found his sheep he also found a treasure trove, hence his gratitude. And that, my friends, ends the physical part of my pilgrimage. 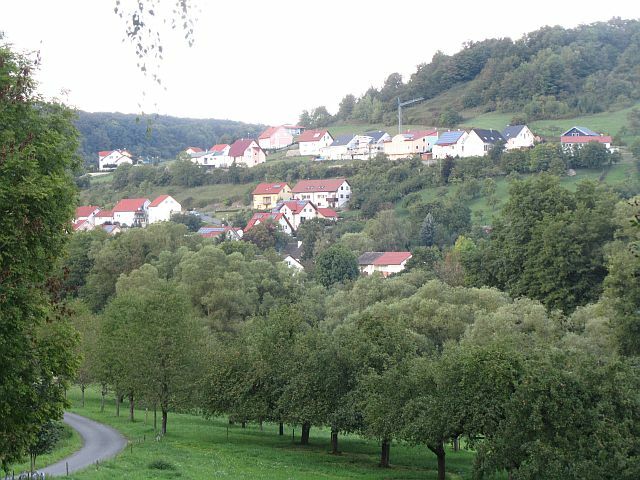 « September 11-12, 2010 – Mulfingen – Pilgrimage Part II – Rest and recuperation.